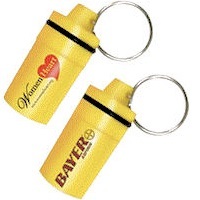 For a limited time, you can get a free Bayer Aspirin Keychain when you take the HeroSmith’s Pledge to carry Aspirin with you. Click the “I Pledge” button and fill out the form. This offer will only be available while supplies last. Allow about 6-8 weeks for delivery. I would love to get 3 of the sample keychains for my grandfather,husband and myself. We all take the 81mg heart tablets everyday.